To our surprise, OnePlus has released an official statement quoting “Android P is coming to the OnePlus 3 and 3T”. We already know, that the latest flagship OnePlus 6 runs the stunning Android P Developer Preview under its Open Beta program. We also know that last year’s OnePlus 5 and 5T will receive Android P OTA update as soon as the official AOSP build is released by Google. Today, we have come to a stunning revelation that the almost 2 year old smartphones – OnePlus 3 and 3T will get Android P 9.0 firmware update in the coming months. The OnePlus software development said that they will skip the Android 8.1 Oreo update and jump directly to Android P 9.0. The spokesperson also said, they took this decision after carefully listening to customer’s demands. 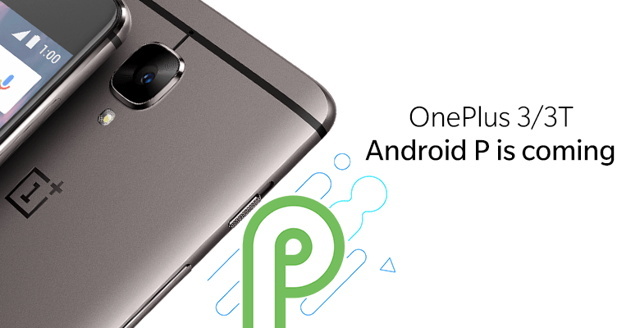 So after internal discussions and evaluation, OnePlus has decided to release Android P for all the major OnePlus phones. Unfortunately, OnePlus 2, One, and X are completely abandoned. As usual, the OnePlus Open Beta channel will see the first Android P build for OnePlus 3 and 3T. So you better be on the Oxygen OS Open Beta program to be the first one to get the Android P OTA update. OnePlus 3 and 3T recently received Oxygen OS 5.0.4 OTA update with the latest July 2018 Android security patch along with major camera improvements worldwide last week. Moreover, OnePlus 5 and 5T just received Oxygen OS 5.1.4 OTA update with similar changelog. OnePlus 6 will be the first device to receive official Android P update with Oxygen OS 6.0+. Currently, it dawns latest OxygenOS 5.1.9. How can i download latest launched android P Beta 4 or android P developer preview on my OnePlus 6 Oxygen OS. Not installed previous android P Beta versions. Can i download & install only latest android P Beta 4 version on my OnePlus 6?